Tri wheel walkers have a swiveling front wheel and two fixed rear wheels. The frame which can be made from steel or lightweight aluminium has handle bars for the user to hold and to use to push the frame. Virtually all three wheel walkers can be folded for transport or storage. The folding mechanism is typically operated by releasing a locking mechanism near the front of the frame. This allows the handle bars and the rear wheels to be closed together significantly reducing the width of the frame. This can be very useful for putting the frame into the boot of a car. 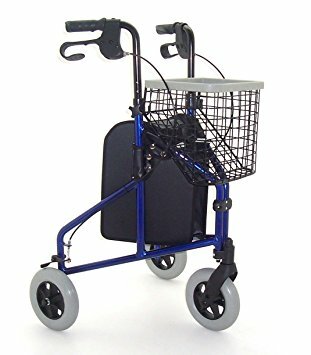 The basket and bag on the three wheel walker may be removed. • Adjustable handle height: 83.5cm/32¾" - 92.7cm/36½"